Girl’s volleyball traveled to Mesquite for the second night in a row but with the stakes a little higher. 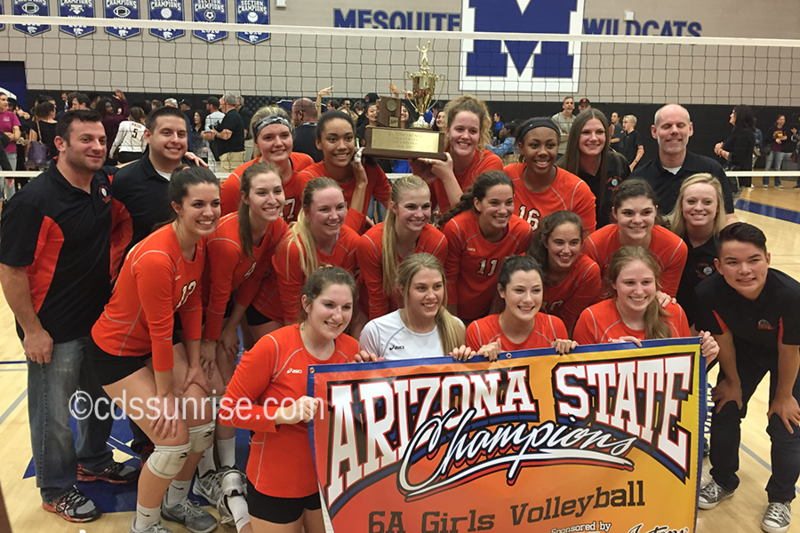 For the first time since 1991, the Aztecs are state champions thanks to their win over rival Mountain Pointe, 25-13, 25-21, 25-15. Head Coach Ben Maxfield said the key to winning the championship came from an overall team effort, leading them to hoist the championship trophy Wednesday night. The Aztecs jumped out to an early lead and did not look back. Freshman star Mady Noble credits the team with staying calm before the big match. Senior Lauren Forte, who arguably had her best performance in high school, agrees that the team handled the environment well and used it to its advantage. The Aztecs turned to Forte and junior Emma West throughout the night to ensure an Aztec victory. Senior Erica Ronda impressed everyone in the gym with 15 kills, 16 digs, 3 aces, and one block. “That was Forte’s best match ever,” Maxfield said. West liked her team’s chances going into the match having played Mountain Pointe a total of five times before this game. 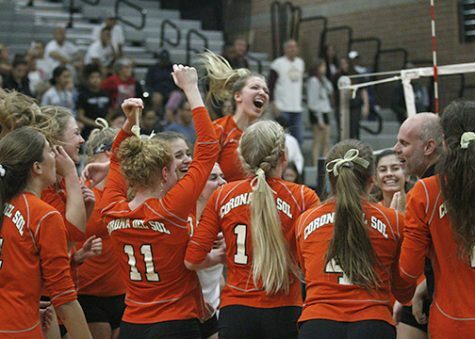 The Aztecs were able to accomplish their ultimate goal Wednesday all in part to that special bond all great teams need to have in order to win. The feeling of being crowned a champion can be one that doesn’t hit for days or even weeks, and the team is going to be sure to enjoy the feeling when it hits.